On the same night that Barack Obama made history by clinching his party’s nomination and John McCain kicked off the general election with a prime-time policy address, it was the vanquished Democrat who may have posed the most relevant question. The answer is, she won’t say yet. But sometimes numbers don’t tell the full story — and last week was a case in point. Despite Obama’s edge in quantity of coverage, Clinton was clearly the driving force in a media narrative that focused largely on three questions. Would she fight on to the convention? Would she unconditionally support Obama? Would she seek the vice-presidential slot? A look at the themes in last week’s coverage helps tell the story. The subjects of Clinton as a possible vice-presidential nominee filled 16% of all last week’s campaign stories studied; the decision to suspend her campaign filled another 9%; and calls for her to withdraw made up another 4%. 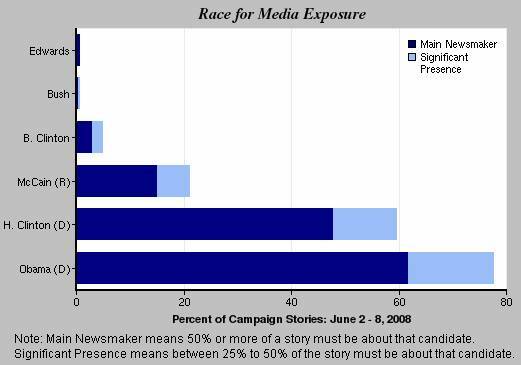 Thus the themes around “what does Hillary want” alone accounted for 29% of all last week’s campaign coverage studied. The theme of Obama, the first African-American to become a major party nominee for President, emerging as a historic candidate, by contrast, accounted for 7%. Just over 2% of the coverage was devoted to Obama’s search for a vice president other than Clinton, and another 3% to lingering controversies involving the Trinity Church in Chicago. It was also a week in which Bill Clinton, whose public profile has fluctuated wildly during the campaign, resurfaced as a headline grabber. And not in a good way. Registering in 5% of the coverage, the ex-president responded to an unflattering profile in Vanity Fair by calling its author, Todd Purdum, “sleazy” and a “scumbag” — an outburst that triggered a campaign apology. GOP nominee John McCain made some news of his own this week by delivering a major speech in Louisiana in which he expressed his own vision of change in this election. And he issued a challenge for Obama to meet him in a series of 10 town hall meeting-style debates. But with the media glued to the end of the Democratic battle, he was a significant or dominant factor in only 21% of stories studied, his lowest level in a month. Overall, by filling 50% of the newshole last week, the campaign generated its third- highest level of weekly coverage in 2008, according to PEJ’s News Coverage Index from June 2-8. (The biggest week, coming in at 55% of the newshole, was Feb. 4-10, the Super Tuesday primary period.) As has typically been the case, the media sectors devoting the most time to the campaign last week where those that included the opinion-driven talk shows. The election consumed a full 74% of the airtime studied on cable and 58% of the airtime on radio. Clinton’s valedictory June 7 speech in Washington in which she threw her support to her rival raised yet another question as fodder for the media narrative. Would her passionate supporters, many of whom complained of sexism and media bias in the campaign, follow her lead? The June 8 Washington Post report on the speech noted that some of her backers in the audience booed at the mention of Obama’s name while bathing her in adulation. “The crowd’s undiminished enthusiasm was of indication of the challenges facing Obama,” the story declared. Thus, the week ended on a theme that will no doubt surface frequently in the coverage of the general election campaign.